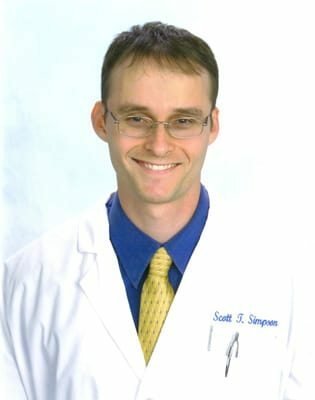 Dr. Scott T. Simpson originally hails from Florida, having attended and graduated from the University of Florida with a Bachelor of Science degree in Microbiology and Cell Science. In 2005 he graduated from the University of Florida College of Dentistry while participating in the Health Profession Scholarship Program through the United States Air Force. Following graduation, Dr. Simpson served three memorable years in the USAF at Malmstrom Air Force Base in Great Falls, Montana. After completion of his active duty service commitment, Dr. Simpson was honorably discharged and headed back to Florida, where he practiced for nine years in the Orlando area as a general dentist at Threshold Dental and Delaney Park Dentistry. With a great desire to be closer to family (and get his son closer to lots of cousins! ), Dr. Simpson, his wife Beth, and his son Andrew took the Oregon Trail out west and have settled in the beautiful city of Tigard. Dr. Simpson and his family look forward to the opportunity to positively impact the local community and enjoy all of the wonders of the Pacific Northwest.